Welcome to the Schlüterhütte! Our Team looks forward to welcoming you in our house. We are open continuously between 15.06. and 13.10.2019. The Schlüterhütte was built in 1898. 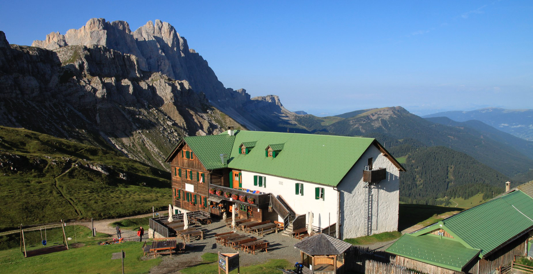 It lies in the middle of the alpine pastures in 2306 m high, between the Dolomites and ,,Peitler Kofl” which are situated in the nature park ,,puez geisler” a part of the world nature inheritance of the Dolomites. Our house lies in between the picturesque Villnösser valley and the ladinish Dolomitenvalleys, and it is also the starting point for pleasant or demanding works. The Dolomites tracks n° 2 and 8 and also the European foot pass Munich – Venice go past us. Our house also has a comfortable restaurant with traditional meals. We also have overnight accommodation with bedrooms, showers and toilets on each floor, or dormitories.